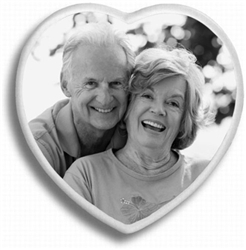 With headstone ceramic pictures, we can take your favorite photograph of a loved one and duplicate it permanently onto a ceramic tile in one of four different shapes. These ceramic photos can adorn just about any headstone, tombstone, gravestone or grave marker with a flat, smooth surface and they are very easy to install. Individuals who visit their loved ones at the cemetery often find it comforting to have an actual photograph of their beloved to look at. It serves as a focal point and helps to comfort the visitor when talking or saying prayers. For many years color ceramic pictures have been available but, it has only been within the last decade or so that technology has made it possible to make an exact replica in color or black and white of the photograph on the porcelain tile. In the past, color ceramics had to be hand painted and often the results were less than satisfactory. Now all you have to do is pick your favorite photo, send it to us and we will make it then ship it to you via overnight delivery. We’ll even send you the original photograph if you submitted a hard copy with your order. It is very important to understand that in order to ensure a satisfactory final product, the original photograph needs to be in good condition and in focus. Old photographs that are faded or have creases from being bent will not work as well. Additionally small photographs and cell phone pictures will not produce the finer details associated with a high resolution picture. Generally if you are submitting an actual photograph printed on photo paper, you want to make sure it is in focus and at least as large as the ceramic picture you are purchasing. If you have a digital photo from a digital camera, it is best to submit the raw image straight from your camera. Do not print it out then send us the print. More details for sending the photo are on the individual product pages. Our line of ceramic pictures is available in 4 popular shapes. The classic oval, rectangle, heart shape and circle. All shapes are available in both color and black and white. Some oval sizes and the small heart shaped ceramic pictures are available with optional frames. These frames come in a variety of beautiful designs and metal finishes and help to protect the ceramic photo. Each ceramic photo is made according to strict standards and is guaranteed for life against fading, exposure to the weather and even vandalism. If something ever happens to the headstone ceramic picture, just contact our office and we will start the replacement process. It may be necessary to send us a picture of the damaged product or the actual damaged product.